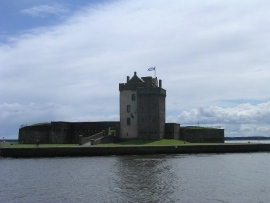 "Broughty Castle - geograph.org.uk - 7506" by Val Vannet - From geograph.org.uk. "Glamis1" by User:Macieklew - Own work. "Whiting Ness - geograph.org.uk - 580833" by Anne Burgess - From geograph.org.uk. 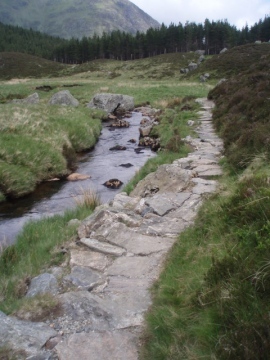 Officially known as Forfarshire until 1928, the Angus region is considered to be Scotland’s birthplace. It was here that the Declaration of Arbroath was signed at Arbroath Abbey in 1320, officially swearing Scotland as an independent nation. 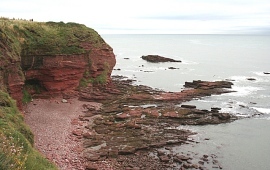 The area is rich in history from the Pictish Era onwards, with notable sites including Arbroath Abbey, Glamis Castle, Arbroath Signal Tower Museum and the Bell Rock Light House. Throughout the county you might notice sculptured stone, which are actually remains of the Pictish Age. 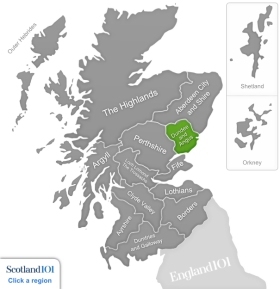 The most famous of which lie in Aberlemno, St Vigeans, Kirriemuirand and Monifieth. Founded in 1178 by King William the Lion, Arbroath Abbey was originally created for a group of Tironensian Benedictine monks. Following this, it was dedicated to Sir Thomas Beckett in 1197. Nowadays, the Abbey is cared for through Historic Scotland and open to the public. 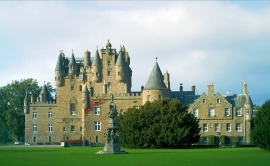 Describing itself as ‘Scotland’s Most Beautiful Castle’, Glamis Castle certainly is impressive. In summer is offers up The Lord Chamberlain’s Men, a programme of outdoor theatre productions. Started in 2004, the ‘outdoor picnic play’ was named after Shakespeare’s original troupe of travelling actors. Aimed at recreating the traditional Elizabethan viewing experience, it is held in the castle gardens where patrons can feast on a picnic while enjoying the performance. 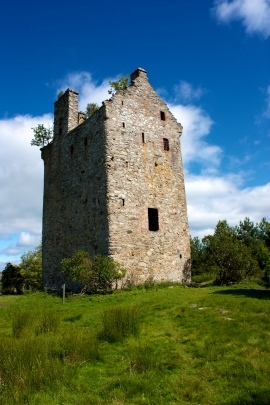 If you wish to find out more about the history of the castle, there are guided tours available during the day. 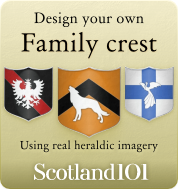 You will learn about how the castle was the childhood home of Her Majesty Queen Elizabeth (the Queen Mother), the setting for Macbeth and see the stately rooms for yourself. This includes the legendary crypt, which houses the castle’s best-kept ‘secret’. 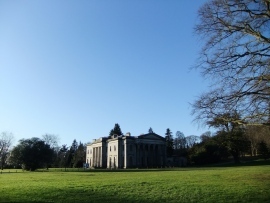 Walks through the gardens are encouraged, and feature a fountain, a raised parterre and beech walkways. The Castle is committed to preserving wildlife and consequently offers feeding stations for the red squirrels that frequent the grounds. Arbroath Signal Tower Museum is set in an incredibly picturesque part of Angus. Found beside the harbour, it celebrates the burgh’s maritime and industrial past. It was up until 1955 that the lighthouse and complex of surrounding buildings housed the shore station and family manning the lighthouse. Now you can wander around the learn not only about the history of the Bell Rock Light House but you can actually see first hand how the keeper’s family lived. The museum also boasts artifacts from the area’s fishing heritage, which along with agriculture and pharmaceuticals, is one of the main industries in Angus.